Diana Wynyard made such an impact onstage in Britain, that she was called by Hollywood, where she made a number of pictures. 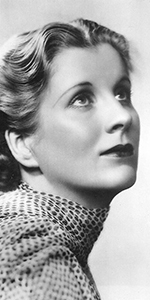 After World War II, she bacame one of the leading lights of Britain's postwar theatre. From the beginning, Wynyard had an intense drive to excell on the stage. After receiving dramatic training in school, she joined The Liverpool Repertory Company in 1925, where she played 40 roles in one year. A lead in the comedy The Devil Passes in the West End was such a success that the production played on Broadway in 1932. Immediately signed by Metro-Goldwyn-Mayer, Dynyard got super busy: she co-starred with John, Lionel and Ethel Barrymore in Rasputin and the Empress (released in March, 1932), then, was loaned out to Fox for their film adaptation of Noel Coward's hit Cavalcade (which played the Chinese in January, 1933, and was playing at the theatre when the Forecourt cememony was held). Wynyard received the Oscar for Best Actress for her decades-spanning role as the matriach of a British family in this film. In the next two years, Wynyard gave it the ol' college try: Men Must Fight, with Lewis Stone (released in February 1933), Reunion in Vienna with John Barrymore (released in June 1933), Where Sinners Meet with Clive Brook, on loan to R-K-O Radio (released in May 1934), Let's Try Again, also with Clive Brook at R-K-O Radio (released in July 1934), and One More River, with Colin Clive, and directed by James Whale for Universal (released in August 1934). All of these films are rather light comic looks at women who are struggling with marriage, side affairs and the usual raft of sob-sister plots. Wynyard acquits herself wondefully in these films, but she must have found the whole Hollywood thing somewhat dissapointing after the success of Cavalcade, so she returned to England. Wynyard continued to make films during World War II and after: The Fugitive with Ralph Richardson (released in October, 1939), The Murder in Thornton Square (released in June, 1940), with Anton Walbrook, which is the same story as the film Gaslight from 1944; she teamed up with Clive Brook again for Freedom Radio (released in February, 1941), played Benjamin Disraeli's wife Mary in The Prime Minister (released in May, 1941), The Remarkable Mr. Kipps (released in June, 1941), from H. G. Wells' novel co-starring Michael Redgrave, and whose director, Carol Reed, Wynyard would marry in 1943; a film adaptation of Oscar Wilde's An Ideal Husband with Paulette Goddard and Michael Wilding (released in November, 1947). After divorcing Carol Reed, she played the mother in John Brown's Schooldays (released in November, 1951) with Robert Newton as the father. Wynyard appeared the television movie Lady Charing is Cross (1955), played the head nurse to three young nursing students in The Gentle Touch (released in March, 1956), then returned to a vacationing Hollywood production Island in the Sun (which played the Chinese in June, 1957). Wynyard appeared on Broadway in Cue for Passion in late 1958, and a revival of the comedy Heartbreak House in the 1959-1960 season. While rehearsing Ibsen's The Master Builder in London, Wynyard passed away of renal disease at the age of 58. 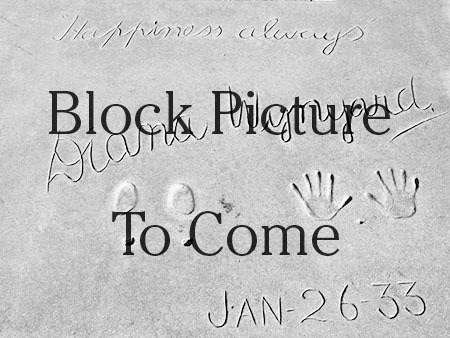 Grauman's Chinese Theatre, Hollywood, California. 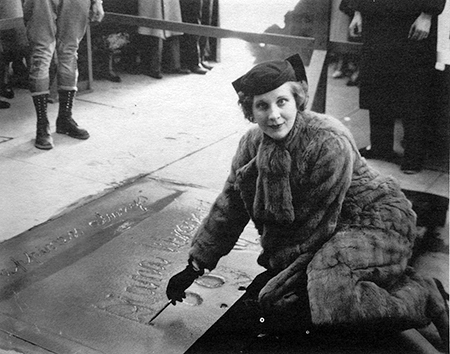 Diana Wynyard Forecourt ceremony, Thursday, January 26, 1933.